Cyril Grant was an Arsenal centre forward who was born in Wath, Yorkshire, on 10 July 1920 and played just two games for the club in the disastrous 1946/7 season. But he had a most interesting connection with one of the more unexpected tales we’ve unearthed on Untold. Some reports have Cyril starting his career with Mexborough, but others say that he began with Lincoln City during World War II – throughout playing at centre forward. He transferred to Arsenal in August 1946 and (amazing as it now sounds) was seen as a possible replacement for Ted Drake. If that were so it can only be that Arsenal’s scouting system must have disintegrated during the second world war (which is quite likely) because it must have been clear from the off that aged 26 Cyril was nowhere near able to be a first division centre forward. But this was the first post-war season which was also George Allison’s last as manager) and it was a season of disappointment and restructuring for Arsenal. The club used 31 players, of whom 14 played less than 10 games. Perhaps even more revealingly, 18 of these players were new to the club in the 1946/7 season – and no club can ever use 18 new players in one season and expect success. Cyril’s first game was 9 November 1946 for which he was given the number 9 shirt. Arsenal lost to Preston away 2-0 and inevitably it was Reg Lewis who relinquished the centre forward’s shirt to play at insight right). It was Arsenal’s 14th game of the season but by then they only had three victories. The second and final game was on 7 December 1946 – another 0-2 away defeat – this at Middlesbrough. Reg Lewis was injured hence Cyril’s second game. Cyril did get a further chance – for the solution was found using Cyril, but not as he might have expected. He was transferred to Fulham in January 1947 as part of a swap deal also involving David Nelson, for Ronnie Rooke. That was an extraordinary deal in itself – but that story is told in the article about Ronnie Rooke. Ronnie Rooke played every game thereafter that season, and kept his place even when Reg Lewis returned from injury. Cyril fared a little better at Fulham, but not much. He scored four goals in fourteen league matches for the club, before moving on in March 1948 to Southend United of the Third Division South where he was twice top goal scorer. That seemed to be more of the right level for Cyril. He stayed there until the end of his league career aged 35 and scored 64 goals in 183 matches before moving on to Gravesend & Northfleet. At Gravesend Cyril met up with another ex Arsenal man, Jimmy Logie. After finishing at Arsenal Jimmy Logie became player manager of Gravesend and Northfleet (now known as Ebbsfleet) in 1955, and stayed there until 1960. This transfer was quite a mystery, as reports that Jimmy took a £1000 signing-on fee to join Gravesend as he was in dispute with Arsenal. What we know for sure is that in 1954-5 Gravesend were bottom of the Southern League – but fortunately there was no relegation. By 1955/6 they were midtable, in 1956/7 they were 6th and in 1957/8 they won the league. They came second the following season as the league was divided into two regional zones. Now here’s another thing: some sources say that by the time of that championship win in the Southern League the manager was Lionel Smith who also played for Arsenal – 180 times and won a cup winners medal with us in 1950. And in that league winning team at centre-forward was Cyril Grant. 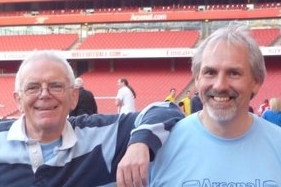 After that I have no information on his life, but it is reported on Arsenal.com that Cyril died in October 2002. Cyril Grant – part of the ex-Arsenal men at Gravesend when they won the Southern League.